As legal challenges to the state’s Congressional and state legislative maps wind their way through the court system, the General Assembly has continued to meet every few days for no-vote sessions during the reconvened session that began January 10. This pattern will likely continue while legislators await court rulings regarding legislative district maps to determine what further action they may need to take. This could include pushing back primary filing and election dates, or working on new judicial selection methods and maps. 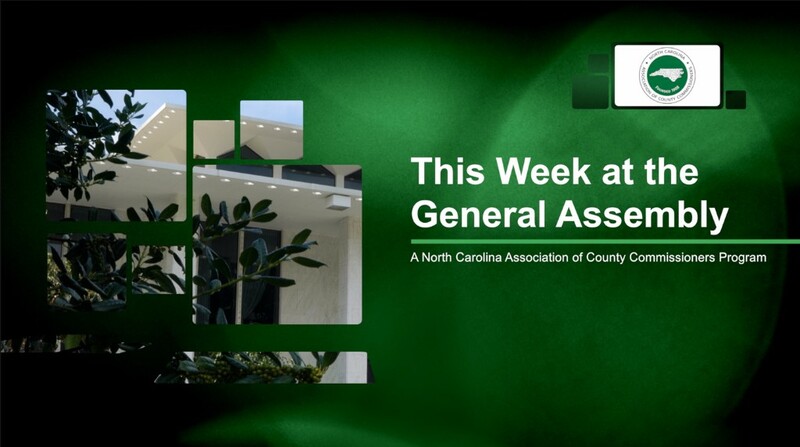 Although the General Assembly took no votes this week, legislative oversight committees continued to meet and discussed issues related to NCACC’s top legislative priorities. This week, the Joint Legislative Program Evaluation Oversight Committee released a report evaluating the process for resolving disputes between boards of county commissioners and local boards of education over education funding. The report is the result of legislation passed in 2016 directing legislative staff to study the issue, report its findings, and make policy recommendations. In recent years, NCACC has strongly advocated to repeal the statutory authority that allows a local school board to file suit against a county board of commissioners over county appropriations for education. This issue is one of NCACC’s top legislative priorities, and the association saw progress during the 2017 legislative session with the introduction of Senate Bill 531 by Senator Tommy Tucker (R-Union). The bill, which limits the ability of school boards to sue counties over education funding disputes passed the Senate last year. However, Sen. Tucker committed not to request its movement in the House pending the release of the dispute resolution report. The report recommends a mechanism to provide education funding in the event the dispute resolution process is unsuccessful. The proposed default funding mechanism would be triggered when a joint meeting and formal mediation between the county and local school board fails to resolve differences. Under the default funding mechanism, the county would appropriate - for the first disputed budget year - funding equivalent to the previous year’s expenditures for operating and capital expenses. The amount would be adjusted by changes in the projected average daily membership in the school district and changes in an employment cost index of salaries and wages for school personnel. If a funding dispute cannot be resolved during the second consecutive budget year, the same default funding formula would determine the local appropriation for education. If a funding dispute cannot be resolved during a third consecutive budget year, the default funding formula would add an additional 3% growth rate to the mechanism used during the previous two years. The final report, including the recommendations of legislative staff and the official NCACC response to the report (see pages 39-40), can be found here. Although the report was released during the committee meeting this week, only a brief overview of the study’s findings and recommendations were discussed. The Committee will likely discuss the report in full detail, along with potential modifications to S531 based on the report’s recommendations, at a future date. The Joint Legislative Program Evaluation Oversight Committee this week also received and discussed a report related to NCACC’s top legislative priority—seeking a dedicated, stable funding stream to address statewide public school capital challenges. The report stems from an evaluation of nine county school systems’ construction needs in relation to their capacity to raise revenue to meet those needs. The county school systems evaluated were: Anson, Bertie, Clay, Davie, Greene, Harnett, Jones, Scotland, and Yancey. The PowerPoint used during the presentation to the Committee is available here. Highlights of the report show that the public school capital needs of the nine counties combined was over $630 million, with Harnett County at the top of the list with over $239 million in needs. The average dollar need per student in the nine counties was $18,180, with Anson County topping the list with a $37,714 need per student. While the statewide average tax rate is $0.66, the average tax rate needed to meet facility needs by the nine counties evaluated is $0.90, with at least four needing a tax rate over $1.05. The report contains full findings and evaluations for each individual county school district. On Thursday, the Joint Legislative Oversight Committee on Emergency Management heard updates from the Department of Public Safety (DPS), the Community College System, and the Department of Public Instruction (DPI) on each agency’s implementation of the state’s school safety policies. The Community College System presented on campus security and enforcement programs. DPS discussed school risks and response management. DPI presented on active shooter policies and training as well as a pilot program for anonymous reporting of safety issues by students using an app called SPK UP NC. All presentations may be found on the committee’s website. Seek legislation to establish a new state-county partnership to address statewide public school capital challenges--including but not limited to maintenance, renovation, construction and debt--through a dedicated, stable funding stream that is consistent from county to county and sufficient to meet the school facility needs of all 100 counties. Seek legislation to repeal the statutory authority under N.C. Gen. Stat. 115C-431(c) that allows a local school board to file suit against a county board of commissioners over county appropriations for education. Support efforts to preserve and expand the existing local revenue base of counties, and oppose efforts to divert to the state fees or taxes currently allocated to the counties to the state. Oppose efforts to erode existing county revenue streams and authorize local option revenue sources already given to any other jurisdiction. Support increased state funding for transportation construction and maintenance needs, and support legislation to ensure that the STI funding formula recognizes that one size does not fit all and that projects in both rural and urban areas are prioritized and funded. Support legislation and funding to raise the Age of Juvenile Jurisdiction from 16 to 18 with the exception of felony crimes. Go to www.ncacc.org/legislativegoals to review North Carolina counties’ complete 2017-18 legislative agenda.